PuzzleMad: They Were "Big in Japan"
They Were "Big in Japan"
Slide Packing - It was "Big in Japan"
When the package arrived from Mineyuki Uyematsu, Mrs S was not amused at yet another delivery of toys for me. My excuse was that 2 of these were VERY special and had been major winners in the IPP design competition. That evening whilst I was balancing beautiful blocks of wood on my sleeping cat's head as I tried to solve them my wife looked pityingly at the cat and sang so you could say that these were "Big in Japan, Alright?" I, of course, couldn't resist it and joined in with her and sang along. Now those of you of a "certain age" will understand my reference in the title - let me say this takes me back to very happy times! Quickly click on play in the video below - go on, you know you want to! Go to 1min 10sec for the best bit! Did you watch it? Did it bring back memories? Yes, I know, Mrs S and I are completely crackers! 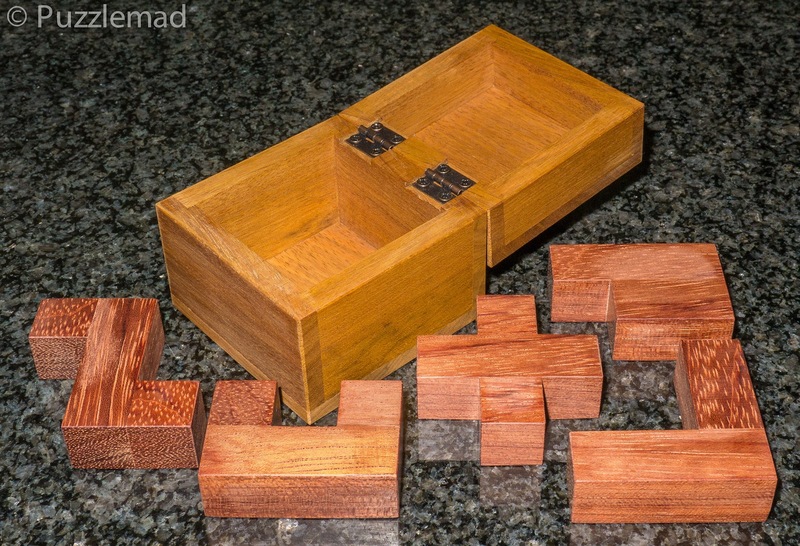 The Slide Packing puzzle was designed by Hajime Katsumoto and produced by Mineyuki Uyematsu and I think has been made from Redheart and Yellowheart woods. 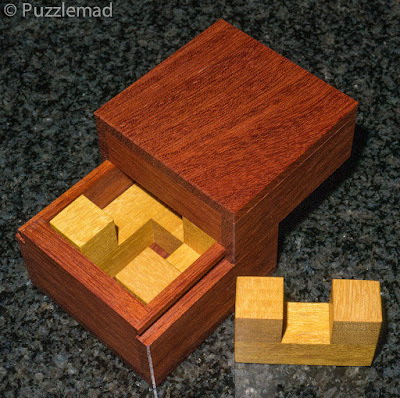 It is a "simple" packing puzzle but was so clever that it won the Puzzler's award in the design competition. How could I possibly decline the opportunity to own and solve such a brilliant challenge. 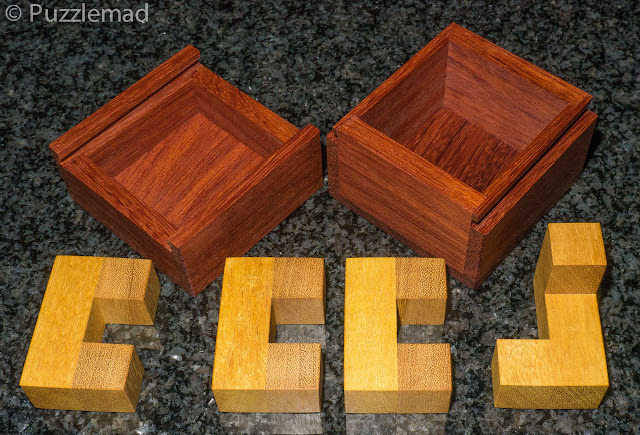 The cleverness in the design is that the 4 pieces consist of 3 C shapes and a single crooked S shape. They are to be fitted into a 3x3x3 space within the box - the twist in the tale is that the lid of the box slides in place and would be blocked by anything more than 2 units high. There are several ways to make the pieces fit into a 3x3x3 cube but not starting with a shape that is only 2 units high! See how the 2 unit high pieces fill the bottom half? No - I won't show you the solution! I'm afraid I don't know what the woods are that this puzzle was made from - if anyone does know then please let me know in a comment below. 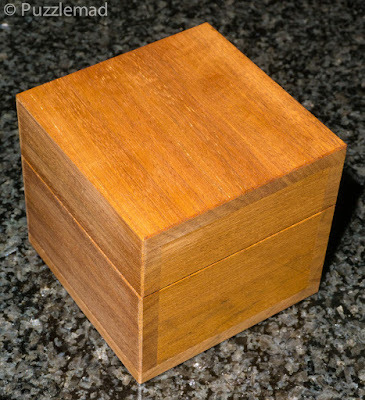 This one is named as it is because all the pieces are pentominoes and of course there are 5 of the shapes to fit in the box. 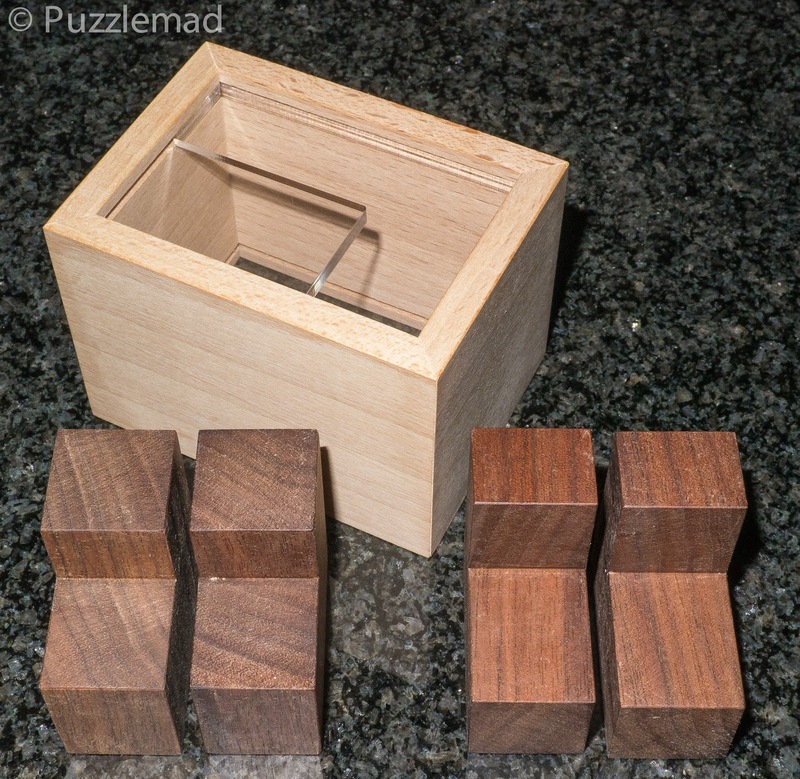 When it arrived four of the pieces were inside and the L shaped one was outside the box as you can see below. Plenty of room to put that 5th piece inside? They are very devious these designers! 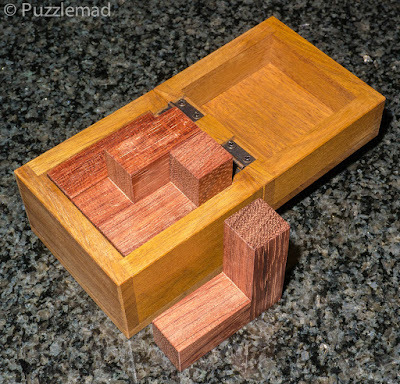 It is for this reason that the puzzle won a Jury Honourable mention award in the competition! Yep - it was "Big in Japan"! Again, a few good thoughts are required and not just random rummaging about. I solved this one a good bit faster than the Slide Packing but the Aha! moment was just as beautiful! I will be taking these to work for the next few weeks to torture my friends and colleagues. If you do manage to get the chance to buy these two fabulously clever puzzles then don't hesitate - they are simply wonderful and just the right difficulty level. Is it solved? Or just an empty box? 4 L's and an L-shaped hole - how hard can it be? This one has stumped me! I have been playing on and off for nearly two weeks and had what I thought were pretty clever ideas but unfortunately they weren't the correct ideas! It remains next to my chair in the living room on my ever enlarging "to be solved" pile. Mrs S keeps looking at me menacingly and I suspect that a Whack! Ouch! is not far away! Many thanks, Kevin, for bringing these to the MPP in Shrewsbury. I had the good fortune to be able to play with (and solve :) ) both Slide Packing and Penta in a Box. 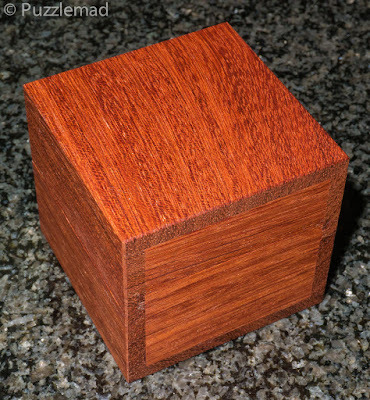 Penta in Box yielded nicely to the application a bit of applied logic and was fun to solve. Slide Packing was even more fun as I tried out a succession of ideas which all failed before the light finally went on. A very nice puzzle which I will definitely be reproducing on my 3D printer very soon. My pleasure Rich! 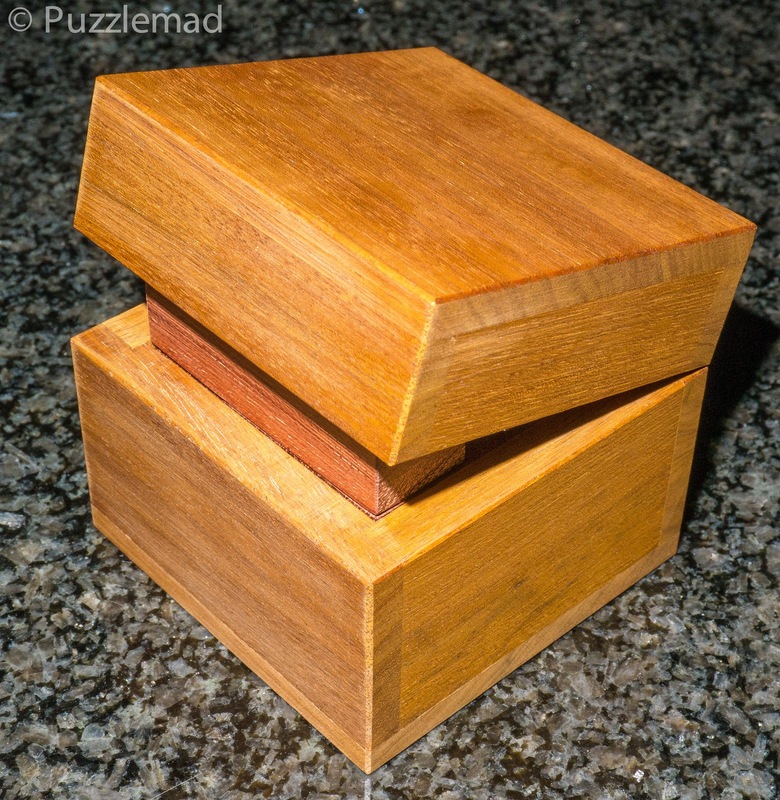 I was amazed at how quickly you solved them (and other puzzles)! I'm not good at solving in public - I'm not sure I solved anything there! I look forward to seeing your printed versions.